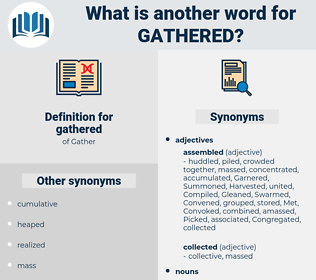 What is another word for gathered? collections, collectors, data, Analyses, Surveys, results, submissions, returns. Generated, collect, Participated, aggregate, Aggregated, celebrated, Greeted, demonstrated, Harvested, Caught, Attracted, thronged, organised, commemorate, Searched, Extracted, amalgamated, Retrieved, heard, Mobilized, Emerged, consolidated, uncovered, Grabbed, taught, charged, learned, Learnt, Existed, mobilization, Undertook, summarized, Procured, Gained, Protested, recovered, Purchased, granted, received, reproduced, Indicated, invited, earned, drew, compile, merged, traveled, travelled, reported, Converged, Enshrined, conferred, Managed, Rallied, derived, attended, sat, Convened, Enjoyed, grasped, Brought, huddled, produced, Referred, tapped, Computed, Contributed, amassed, therein, Appeared, secured, Summoned, Ranged, Deployed, Marched, broke, spoke, realised, Provided, hosted, recognised, accepted, featured, reflected, realized, shot, developed, accessed, Stipulated, come, Came, Became, Achieved, welcomed, held, briefed, crowded, contained, saved, Prompted, Remained, requested, Were, flock, Flocked, Worked, Proceeded, found, expressed, attempted, Asked, Visited, Took, Upheld, Consisted, Yielded, formed, meet, Met, Had, processed, Caused, joined, tried, involved, positioned, listed, Scored, Happened, reunified, noticed, Talked, Succeeded, Bought, Claimed, finished, opened, applied, figured, youth, Accounted, Wished, Gave, Awarded, Occurred, Allowed, put, fired, called, focused, saw, pulled, Believed, won, Got, rounded, included, sensed, kept, Looked, Meant, Went, thought, collected, 'il. Generated, arranged, integrated, disaggregated, Aggregated, categorized, Investigated, sheltered, registered, Harvested, accumulated, Caught, Attracted, circulated, incorporated, centralized, organised, discovered, prepared, Extracted, amalgamated, coordinated, Created, Disseminated, Mustered, concentrated, located, appreciated, Retrieved, altered, established, heard, Mobilized, leveraged, Accommodated, Emerged, regrouped, consolidated, Quartered, represented, repeated, uncovered, allocated, initiated, taught, charged, manufactured, calculated, Inferred, learned, Learnt, Undertaken, Entered, available, Reaped, summarized, clustered, Procured, synthesized, Explored, Gained, measured, recovered, Purchased, engaged, Delivered, organization, interpreted, present, presented, granted, received, attendance, Constructed, understood, predicted, elicited, educated, Indicated, transposed, Captured, shared, earned, drawn, Compiled, Rendered, retained, merged, reported, solicited, transmitted, implemented, Enacted, Reached, furnished, recalled, misunderstood, Enshrined, constituted, identified, mastered, Rallied, reconvened, accomplished, Tabulated, derived, advertised, reunited, coalesced, executed, attended, removed, elected, Regarded, written, sat, united, attached, accrued, described, Convened, selected, Comprised, determined, realigned, Enjoyed, Examined, Detained, appointed, grasped, Introduced, seized, donated, Brought, Communicated, structured, detected, observed, recorded, produced, considered, trapped, Referred, Computed, Consulted, stockpiled, assumed, struck, amassed, stored, Exacted, tracked, composed, secured, Answered, answers, fostered, condensed, responses, associated, documented, assured, supported, trained, perceived, enforced, Deployed, Submitted, centred, Adduced, possessed, permitted, grown, realised, reinforced, Herded, published, Forwarded, Provided, recognized, recognised, accepted, featured, reflected, realized, experienced, attained, assembly, shot, endorsed, sought, developed, Performed, accessed, conducted, Surveyed, ensured, come, become, affected, Preceded, prescribed, Enabled, ripened, cast, edited, Achieved, grouped, welcomed, monitored, disclosed, sourced, pursued, held, connected, presence, crowded, contained, Been, Displayed, maintained, risen, covered, Bred, Carried, requested, divided, reviewed, laid, Borne, deducted, Lodged, Housed, set, encased, Afforded, commissioned, found, outlined, expressed, forfeit, forfeited, packaged, taken, defined, Discussed, built, collapsed, classified, Asked, touched, satisfied, Cited, subsumed, mistaken, cost, vested, cleared, rolled, tabled, posed, led, Logged, completed, qualified, embodied, sampled, Picked, Canvassed, Mentioned, specified, Filed, Yielded, Helped, desired, Deemed, sold, Entailed, HIT, Supplied, studied, Levied, formed, piled, Met, induced, imposed, seated, processed, Levelled, Caused, joined, involved, fallen, Culled, Flown, positioned, Stationed, Distilled, listed, Shown, Scored, Resulted, Notified, fulfilled, reunified, Pooled, noticed, impacted, noted, Bought, jammed, packed, Claimed, clumped, stated, Cantoned, placed, finished, Dealt, cashed, twisted, Complied, codified, given, unified, paid, known, Accounted, Awarded, used, Allowed, effected, put, unbundled, fired, implied, called, focussed, seen, Bundled, focused, coupled, Lumped, won, Got, Incurred, rounded, posted, included, funded, linked, Viewed, based, collected, done, made. Garnered, organized, assembled, Collated, concentrated, Fetched, ascertained, engaged, understood, Captured, staged, reunited, surrendered, Swarmed, raise, sought, massed, Picked, fulfilled. organized, assembled, ascertained, compilation, Deduced. She did not know that the data of a great experiment have not yet begun to be gathered together. When all was done the haymakers gathered round.